In early 1918, the US War Department created the Student Army Training Corps (SATC) as a way to hasten the training of soldiers for the war. Students would enlist in SATC and simultaneously take college courses and train for the military. 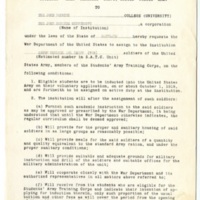 Unlike the existing Hopkins ROTC, the SATC students were required to live and take all meals on campus. Students lived in austere quarters in Gilman Hall, Maryland Hall, and Latrobe Hall. They adhered to a strict military schedule of study and training and had to apply for passes to go off campus on weekends. SATC students arrived on campus in October 1918 and, due to the collapse of the Central Powers that fall, the program was disbanded in December 1918. 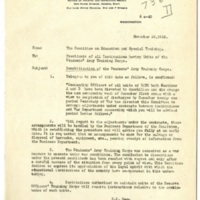 These memos show the university’s commitment to accept 708 SATC students on the Homewood and East Baltimore campuses, and the War Department’s order to disband the program. 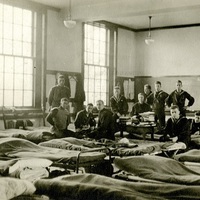 The photos depict SATC students in Homewood campus barracks.